Nick Schultz | The Phoenix Women's volleball team huddles up between points. 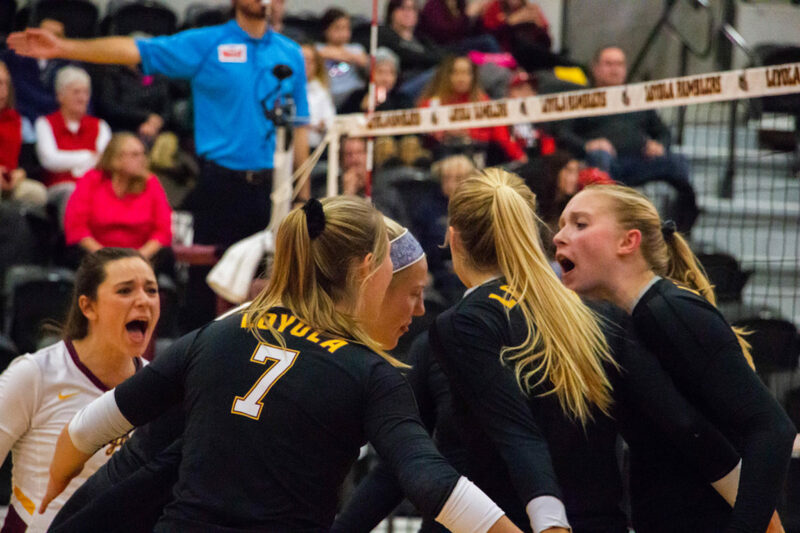 One year after finishing 5-24, the Loyola women’s volleyball team went 16-14 — an 11-win improvement. Now, with her first season behind her, head coach Amanda Berkley looks to use this season as a benchmark for future success. Berkley said she liked what she saw from her team throughout this season and thought everyone played with energy and passion. The team will use this season as a benchmark as it hopes to improve on the good things it did this year, according to Berkley. Berkley said the team is already looking forward to next year and has already started to move on from this year and focus on offseason improvement. She said the team didn’t have regrets on the season and everyone is looking forward to putting in the work for next season. “We always did what we thought was best in the moment, there is always a point or two that you wish you could get back or do over but overall … no regrets,” Berkley said. The Ramblers finished with an 8-4 non-conference record, and 8-10 Missouri Valley Conference (MVC) record and ranked third in the MVC in hitting percentage at 22.4 percent. Berkley said she saw improvement from the team throughout the season and looks forward to seeing how much the team can improve from now to the beginning of next season. After losing their first two matches, the Ramblers went on an eight-match win streak from Aug. 25 to Sept. 25. Berkley said she saw the team play with high intensity early in the season and saw a lot of potential among many of the team’s younger players. Berkley said she saw the younger players develop and improve their game from last season and was overall impressed with the way the team evolved and adapted to adversity. One player who made strides was redshirt junior middle blocker Heather Kocken, who more than doubled her total number of kills from 114 in 2017 to 229 in 2018. “From the spring to now I think definitely a lot of players saw a lot of improvement … we talked about several players that saw a lot of improvement and we are all very proud of how they did improve over that time period,” Berkley said. Loyola led the MVC in blocks per match this year with 2.4. The 0.16 difference between the Ramblers and second-place Missouri State University’s 2.24 blocks per match is the same as the difference between Missouri State and the fifth-highest total. Loyola also averaged the third-most service aces in the MVC at 1.26, which is an improvement from last season’s 1.1, and held opponents to the eighth lowest number of kills at 1,441 throughout the season. Overall, Berkley said she was pleased with this season and can’t wait to continue to build off of their success as 11 players are expected to return.